Home » Barbs and Backlashes » Ah, Ice! 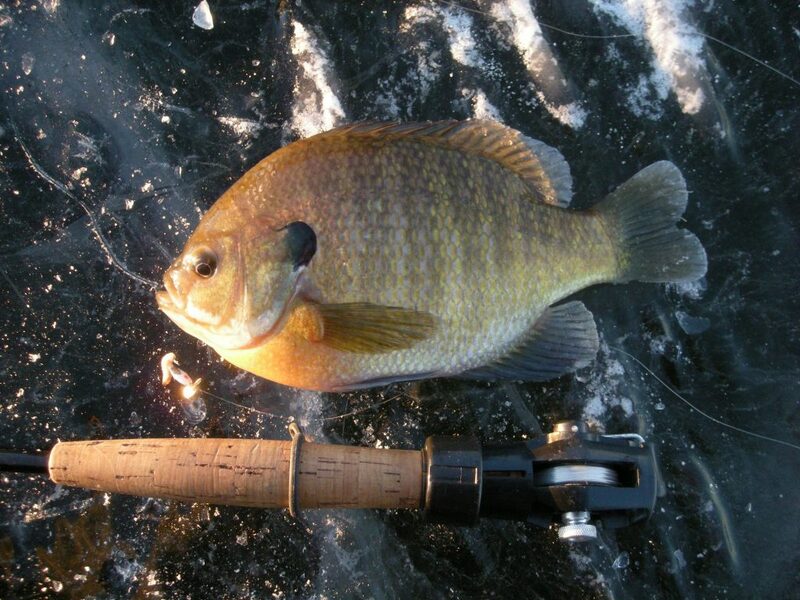 We are nearing the middle of January, and I just realized I have not blogged about any of my ice-fishing adventures, yet. . . .
Hmm, let me think, I have been on the ice nearing a dozen times now, have been on waters from the central and west-central parts of the state to the southeast. I will not tell you that my partners and I have dried off any exceptional fish so far, and perhaps that is why I have been slow to blog about it. But, we have caught fish pretty near every time, some times better than others. My “New Year” begins the first time I drill a hole in the ice that season. I do not have a “ball drop”, I have a jig drop. 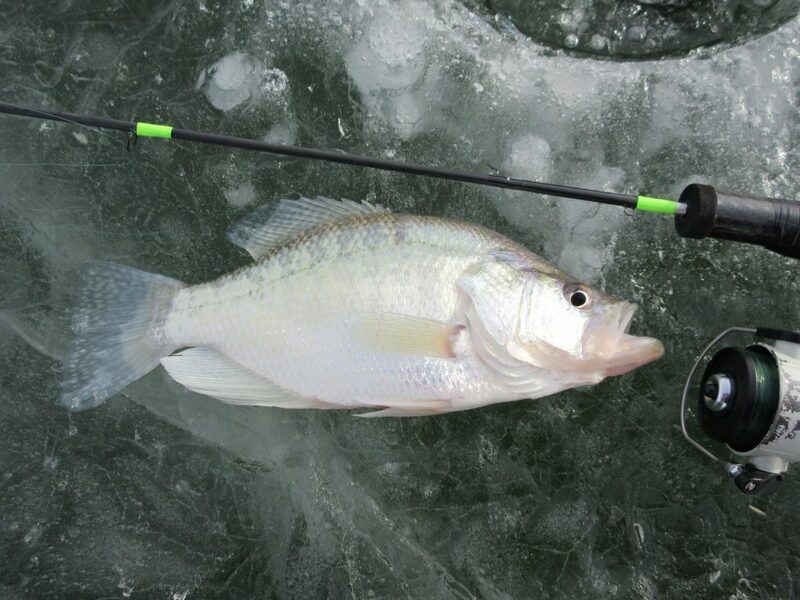 The new year begins when the first fish is pulled through an ice hole. New Year’s Day 2017 occurred before Christmas this year; it’s gonna be a good year! I pulled a couple, three small fish through a hole, but this is the one I am going to claim as the New Year’s Fish, 2017, a 13-inch+ white crappie, caught on a new, custom-made, jigging rod (Thanks, “Swoaby”!). I caught a black crappie later that day that was also 13-inches+. I should have snapped a photo of that fish too, but the camera was in my bucket and I was fishing a hole several yards away. Sorry. 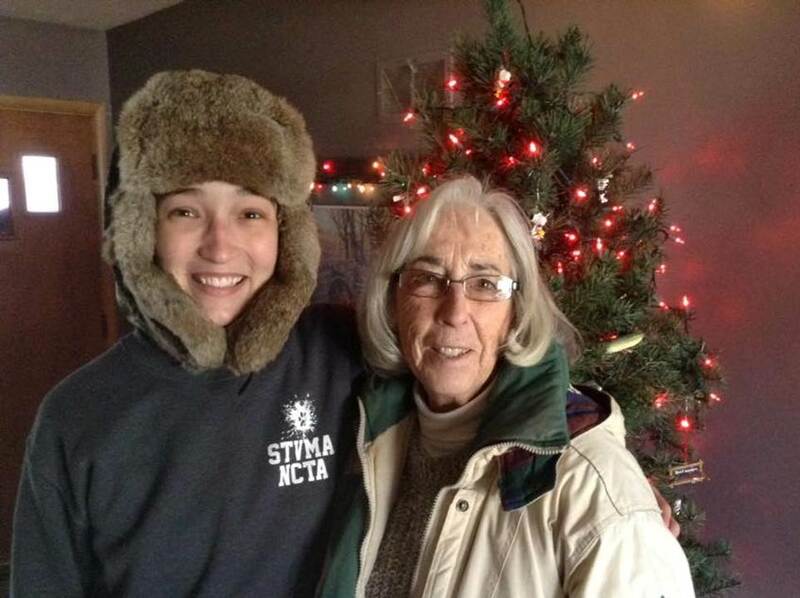 Of course my daughter was home from college over the holidays and my Mom also spent several days with us. My son and I got them bundled up for some ice time too! 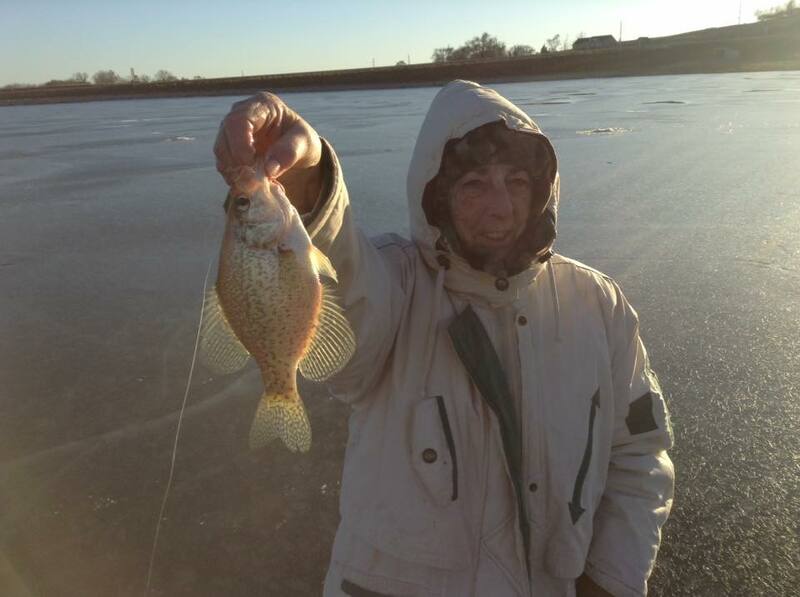 Yep, my Mom can fish, ice-fish! How about yours? The rain and wind on Christmas did our ice conditions no favors. I will always tell you that you have to make sure the ice is safe EVERY TIME you walk on it. 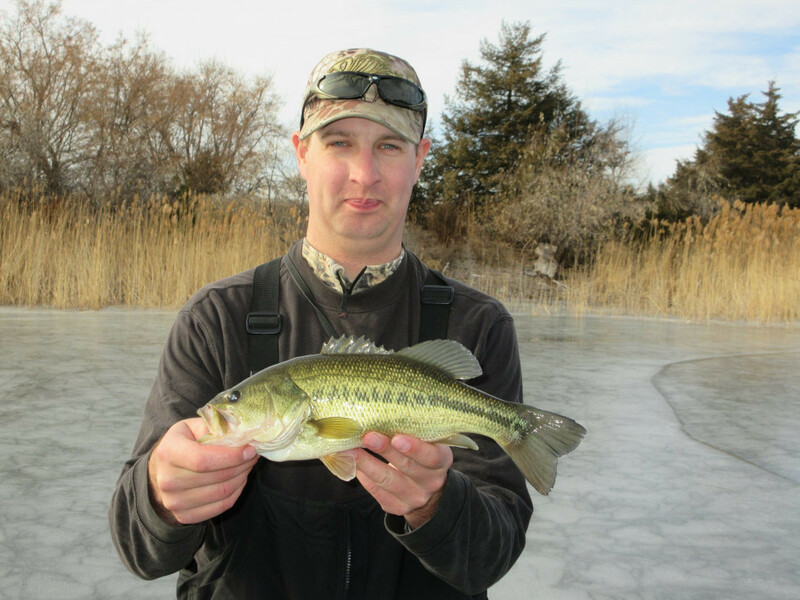 We had some sketchy ice conditions right after Christmas in southeast Nebraska, but at the same time farther north and west, even if we had wanted to, we could not have fallen through the 11 inches of ice we found on some waters. My son Daniel and I spent one long day in the ‘hills looking for big panfish. Had one of my nephews join us on the ice for the first time in a few years, was great to have him with us again, and another frequent ice-fishing friend met us there. We fished very hard that day. My motto on ice is “Drill baby, drill”–keep moving until you find fish. Boy, did we that day; I will guarantee you we drilled at least a hundred holes. We used both electric and gas augers and were very happy that we had both. We caught numbers of small yellow perch, and a bass or two early, but just could not find the big fish we were hoping for. Late in the day, we circled back to an area that we thought had potential and as the sun hit the ridge line of those beautiful ‘hills we had about 30 minutes when we caught some bluegills. Those fish were small too, but then I iced an 8+incher and Daniel got one quite a bit bigger. And that was it. The bite lasted all of 30 minutes. It was one of those days where we spent hours on the ice for a brief flurry at sunset. Oh well, the fish were there, all we need is to know there is potential for big fish and we will be back. I have to admit that during those days when the bite is tough, our concentration sometimes lags. Around about midday you just have to pop the top on a Dr. Pepper, chew on some jerky, tell stories, laugh, and goof off a bit. 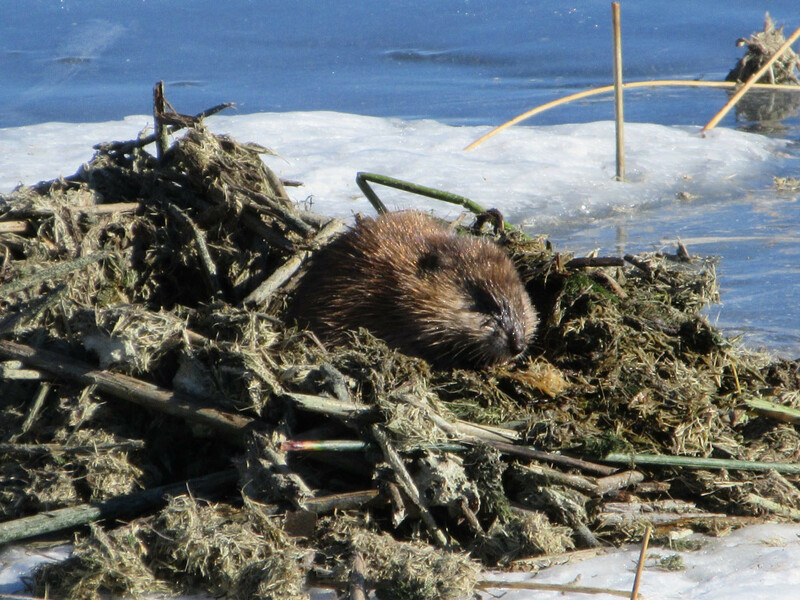 This time we noticed a muskrat nibbling on bulrushes in a nearby “pushup” or feed bed. If we had a trap with us we could have at least caught a ‘rat or two instead of the fish that were not biting. As it was, we just watched and took turns seeing how close we could sneak up on a muskrat. My nephew pulled off a beauty of a sneak using a belly slide; we would have died laughing if a muskrat would have come outta the hole when my nephew poked his head in it. That muskrat feed bed was sitting over 6 feet of water. The muskrats using it had been swimming there frequently enough to keep an open hole through the ice, you could watch ’em swimming under the ice. I shoulda dropped a tear-drop down that muskrat hole, there probably was a 2-pound bluegill sitting down there. Fished an interstate lake one beautiful, shirt-sleeve afternoon. 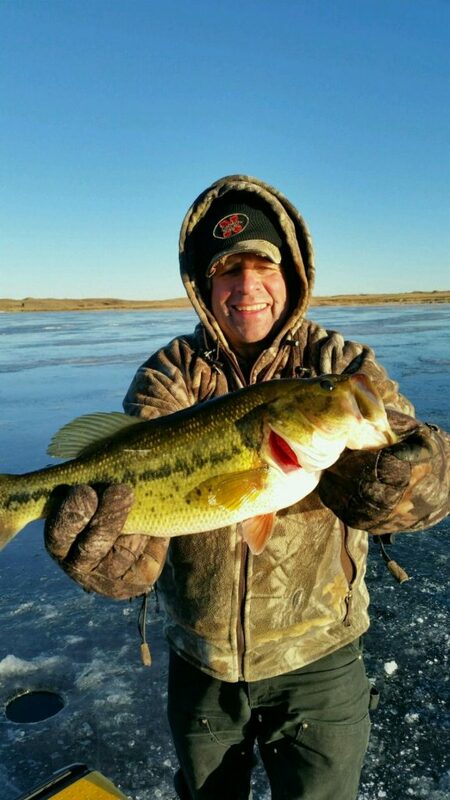 Again let me say something about ice safety; we fished on 4-6 inches of good ice that day, but as is true with all pits in Nebraska, the ice thickness along the west and especially northwest shoreline of the pit was much, much thinner. 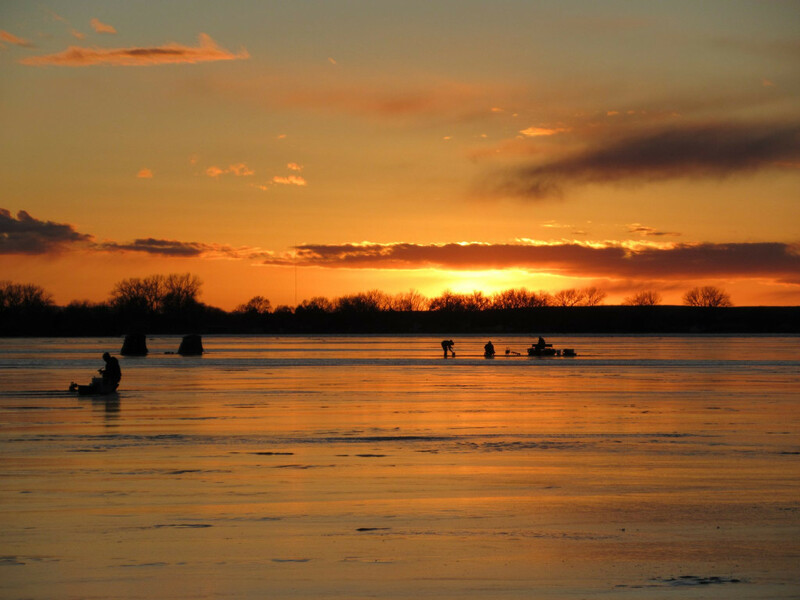 Always be especially careful on the ice of any sand, gravel, or borrow pit including all of the interstate lakes. Those waters can be ice-fished with no problem, but even then west and northwest shorelines of those waters can have enough groundwater flow to have thin ice. We caught a bunch of ‘gills and a couple, three black crappies there. Daniel got a bass on one of our new tip-ups. I had a bunch of old, wooden frame tip-ups that we have used for years. My Dad had them for I do not remember how long before I grabbed them. Those things needed replaced a long time ago and I finally got around to upgrading them this ice season. So, here is the inaugural fish on the new tip-ups. Found out later we should have been back up in the ‘hills fishing with my cousin, his bass was bigger. Got out of the house for a little bit late on the day of our new year’s festivities. Again I did not catch much, had one fish come in on my jigging bait and was a bit surprised when I pulled it through the hole. 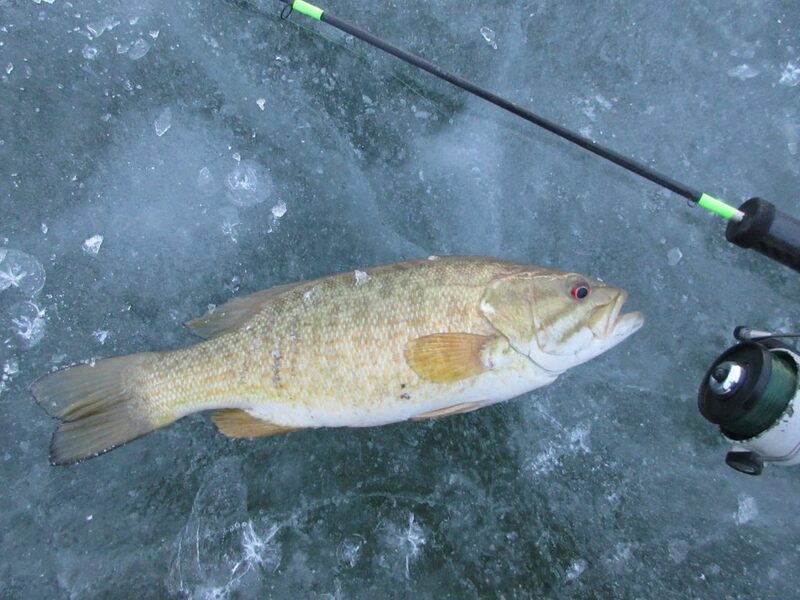 I do not recall that I have ever caught a smallmouth bass through the ice! It was not a big smallie, 13-14 inches, but a smallmouth bass nonetheless! There are some pictures and stories from my time on the ice so far this winter. I will tell you all of those fish were caught from public waters. If you want to know where, look HERE. Every fish pictured was slid back in the hole after posing for their picture. 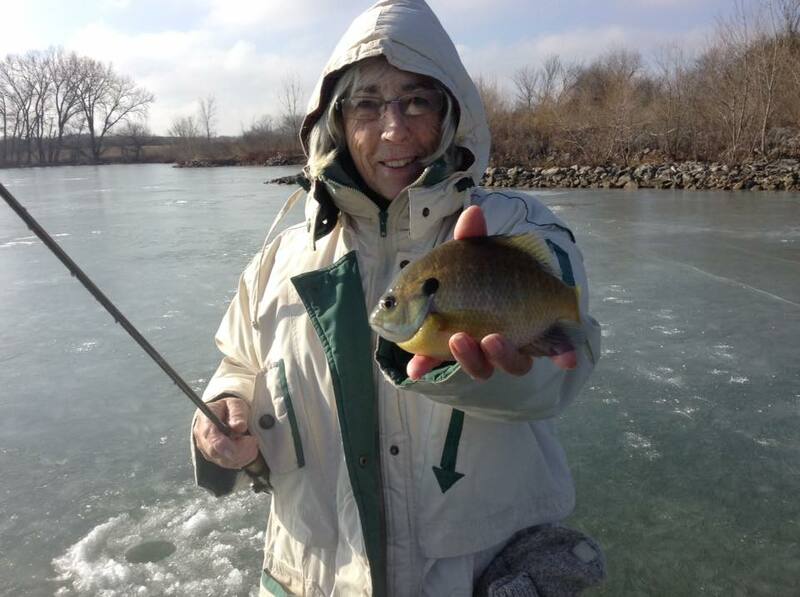 Right now ice conditions are looking good and there is going to be more ice-fishing! I am looking at several more opportunities to be on the ice somewhere in the state in the days ahead. Fish will be caught! Stay tuned!